Are you sick of recipes from Martha Stewart yet? 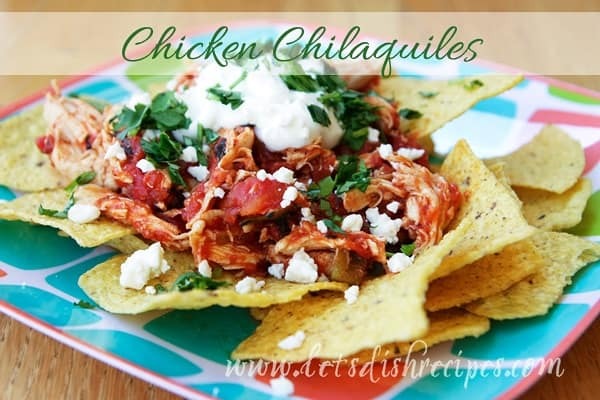 Well, Chicken Chilaquiles is another one of my new favorite recipes from her Great Food Fast Cookbook. I absolutely love this dish! 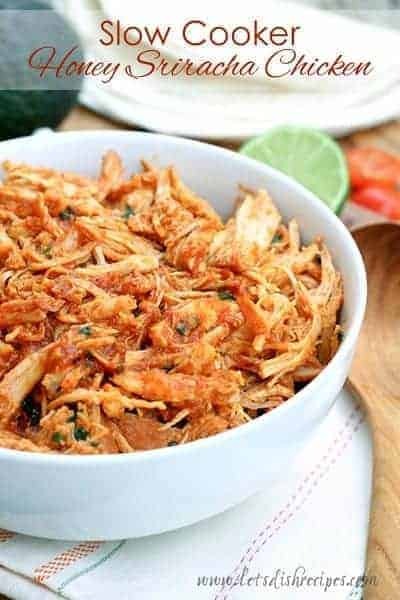 It’s quick, easy and a great way to use up leftovers. I think it tastes best if when you get everything good and mixed together in your bowl. Just a note: canned chilies in adobe are really hot, so I recommend starting with one. After I open a can, I like to put individual portions in small zip-top bags and freeze them to use later. I can’t imagine a recipe using an entire can. HOT! But don’t leave them out. They give this dish such a great flavor. 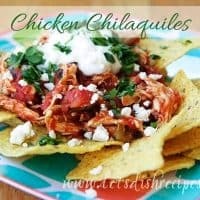 If you can find queso fresco (fresh Mexican cheese), use it in place of the feta to make your chilaquiles more authentic. Combine oil and garlic in a large saucepan. Cook over medium heat, stirring occasionally, until fragrant and sizzling, 1 to 2 minutes. Add both cans of tomatoes with their puree, chopped chipotles in adobo, and 1 cup water. Bring to a boil; season with salt. Reduce heat and simmer rapidly until lightly thickened, 6 to 8 minutes. Add chicken and cook, stirring, until hot, about 1 minute. Remove from heat and stir in chopped cilantro. Who Dished It Up First: Adapted from Martha Stewart’s Everyday Food: Great Food fast Cookbook. I missed making something like this! I have always loved chips especially the tortillas! This recipe looks delicious! Everything on here does. Now following and can’t wait to see what you make next!! This looks YUM! 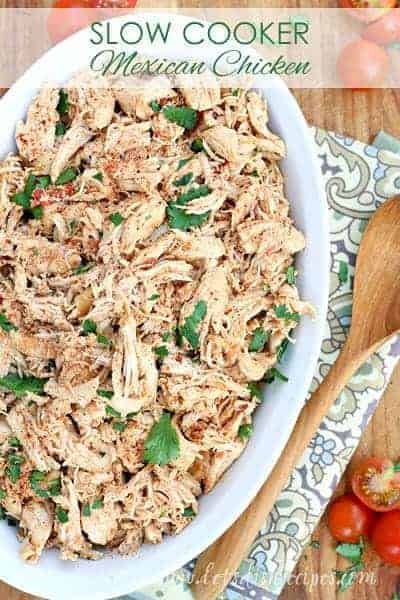 perfect to throw together for a weeknight dinner!